Something of a whispered entity in its native country, REBIRTH OF NEFAST here offer an opus of mesmerising, meticulously crafted black metal. With an obvious appreciation for the genre’s most serious aspects, both musically and ideologically, not a superfluous note or utterance is to be found on this release. 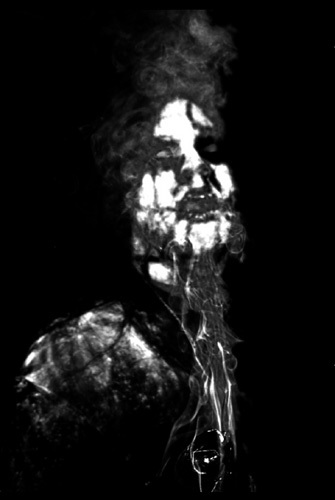 'Only Death' is comprised of three lengthy tracks that blend into one dark hymn. Within, we find a perfect balance of mid-tempo and blasting sections, of aggression and eerie catchiness. A repetitive, chanting introduction sets the mood ominously and a wholly cavernous sound is peppered with moments of haunting genius. The music presents interesting variations on what, at first, seem like standard black metal riff structures. The percussion is steady and capable throughout with its own tone complimenting the dark recesses of the areas the guitar and bass travel to. The vocals are grumbles, howls and demented shrieks that fit neatly under the music but, suitably, are never lost. As one of a handful of noteworthy, serious Irish black metal acts (both past and present), REBIRTH OF NEFAST have proved their worth, more than adequately. An Irish band void of neo-pagan yearnings, quaint scenery and tales of yore, REBIRTH OF NEFAST present only an utter bleakness and are all the better for it. Originally uploaded to Encyclopaedia Metallum: The Metal Archives under the username 'torchia', on 01 September, 2008.